Bulova Marine Star Chronograph — Vesper & Co.
Bulova Marine Star chronograph , Swiss. Made in the 1970s. Fine and rare stainless steel chronograph wristwatch with second, hour and 30 minute registers, bi-directional rotating bezel calibrated to 60 minutes. Case: Three-body, polished and brushed, screwed-down case back engraved: "Bulova Marine Star Swiss made," graduated bi-directional revolving black bezel, lapidated lugs. Dial: Black with luminous baton numerals, subsidiary seconds and 30-minute register dials, outer 1/5th second track with 5-second Arabic markers. Luminous steel baton hands. Movement: Calibre Valjoux 7731, rhodium-plated, 17 jewels, straight-line lever escapement, monometallic balance, shock absorber, self-compensating flat balance spring, index regulator. Bulova was founded in New York City by Joseph Bulova in 1875. The company was very successful producing and selling watches in the USA. In 1912 they expanded their production by establishing a manufacture in Bienne, Switzerland. The company expanded its reach throughout the 20th century from its headquarters in Flushing, New York, and was considered an icon of American watch production. Bulova reached its pinnacle in the early 1960's with its production of the Accutron. In 1967 the company purchased Universal Geneve, but like its Swiss counterparts it fell a victim to the era of quartz. Today, Bulova is owned by Citizen. The Bulova Marine Star is an intriguingly obscure model. Its case is very similar to the Zenith Italian Military CP-2, made for A. Cairelli, and they share some of the dial characteristics. 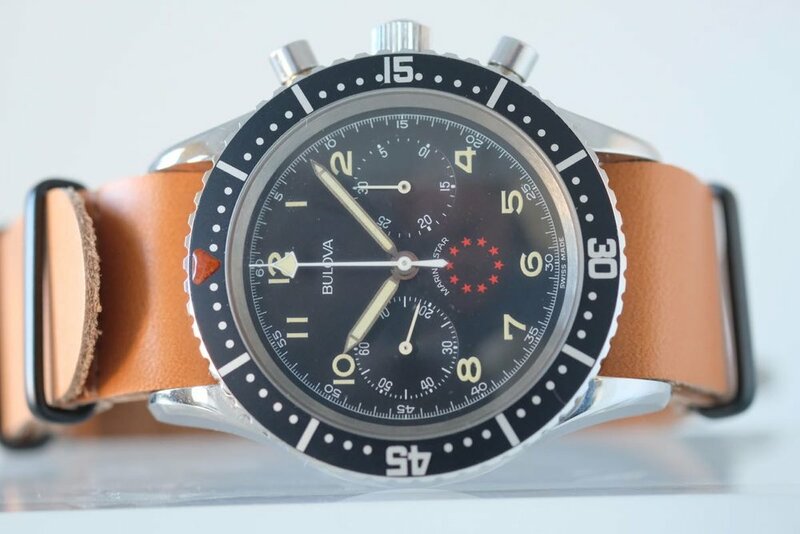 A few variations of the Bulova Marine Star were produced over a 20 year period, of which the two-counter chronograph with a black dial with Arabic numerals is very similar to the Zenith Cairelli. The Marine Star was introduced in 1960 and was certainly manufactured for military use, although there are no government-issued Marine Stars currently known. The watch shares many elements with the Bulova worn by Astronaut Dave Scott on the surface of the moon during the Apollo XV mission. Scott's NASA-issued Omega Speedmaster failed sometimes during the mission, and instead he used his own Bulova chronograph. The Marine Star with its large sized case and legendary movement holds a unique appeal for many collectors: it is rare, unusual and still affordable. Buy it while you still can!